Think of cineraria flower as a living bouquet. You'll find these beautiful bloomers in floral shops in midwinter to early spring. When you're selecting a new cineraria plant, look for one with plenty of unopened flower buds. Yeah, I know they're not as attractive as the fully open flowers; however, you'll enjoy your cineraria plant longer, watching all its flowers bloom. Choose the color you like. Those daisy-like flowers are available in a range of vibrant colors, including pink, violet blue, purple or red -- often with an inner white ring around the central eye. Keep your plant in a cool location and well-watered, and you'll enjoy its profusion of flowers for about a month or two. Although short-lived, cinerarias are sure to brighten up your home in winter. What could be a better pick-me-up when your outdoor flowerbed is blanketed with snow? Put your plant near a cool east- or north-facing window. Better yet, display three pots together in a windowbox-type planter. Wondering whether to repot? You won't need to because cineraria is a temporary house plant. If you want to cover up a plain nursery pot, slip it into a cachepot. This type of decorative pot doesn't have drainage holes, so it's a good idea to put pebbles in the bottom to keep the inner pot above the drainage water. Wilted plants are often caused by dry soil. Flowering plants are thirsty, and this is one will collapse if it dries out. Check the soil often and aim to keep it lightly moist at all times. Water thoroughly to wet all the roots, allowing water to drain out the drainage holes. Don't overwater, though. Soggy soil will lead to root rot, which also causes wilting. If your plant gets root rot, just toss it out...it won't recover. Flowers that wither soon after opening are likely caused by hot, dry air. Ideally, keep your cineraria cool -- around 50°F/10°C. Your flowers will last longer with cool temps. In fact, you can move your plant to an enclosed porch or a sunroom for the night, if you want. Don't worry if the temperature drops to 40°F/4°C at night; cinerarias love the cool, moist air. Something bugging your plant? It's likely aphids. These tiny insects tend to hang out on stems and flower buds. It's a good idea to look over your plant each time you water. If it is infested, get rid of it. You don't want these pesky critters to spread to your other indoor plants. Height: 1-2 ft (30-60 cm). 'Nana' varieties are more compact. Light: Bright indirect sunlight; some cool morning sun is fine. Leaves will become pale if they are in direct sunlight. Water: Keep the potting medium lightly moist at all times. Overwatering will cause root rot. Humidity: Moderate to high (at least 40% relative humidity). Set pot on a humidity tray or use a cool-mist room humidifier to raise the humidity around the plant. Temperature: Keep your plant in a cool location (50-65°F/10-18°C). It will tolerate a low of 40°F/4°C. Soil: Peat-moss based potting mix. 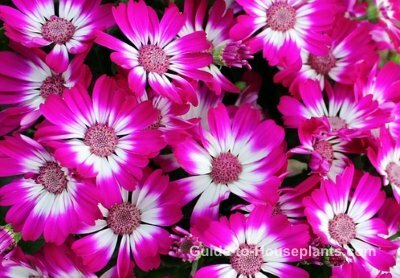 Propagation: Sow cineraria seeds in summer to produce flowering plants the following winter.